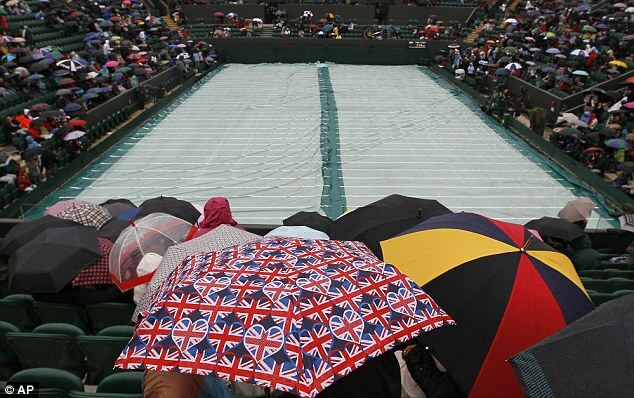 According to the Met Office, the UK has just experienced the wettest June since records began in 1910. This actually is a slightly misleading statement, as the Met Office, on their own website, have records going back to 1766, which confirm that, in England and Wales, 1860 was the wettest year with 157.1mm compared to 151.2mm this year. (Figures for Scotland are shown separately, which show there have been seven wetter Junes since 1910). As for UK temperatures, June has been the 19th coldest since 1910 and 0.35C colder than the 1971-2000 average. SUMMARY – PRECIPITATION: The forecast for average UK rainfall slightly favours drier than average conditions for April-May-June as a whole, and also slightly favours April being the driest of the 3 months. SUMMARY – TEMPERATURE: The UK-average temperature forecast for spring (April-May-June) shows a range of possible outcomes that are warmer than the range observed between 1971 and 2000 (our standard climatological reference period), but quite similar to the last decade. For April the forecast also favours temperatures being warmer than the 1971-2000 reference period. Analysis of rainfall data for June back to 1766 highlights some interesting facts, as the two following graphs show. There is naturally a lot of noise in the first graph, but the trend line indicates a drop in rainfall. It also shows just how big the inter-annual variability can be. (Well, this is England we are talking about!) The ten year running average, however, shows some significant changes occurring over the period. 1) Much wetter Junes seemed to be a regular occurrence at the start of the record and then again in the mid 19thC. 2) Both these interludes were followed by much drier times, particularly in the early 20thC. 3) Compared to the decadal variability apparent through most of the record, rainfall levels since about 1960 have been remarkably stable. Could the trend in the last few years towards wetter Junes be marking a return to the volatility of the 18th and 19th centuries? Meanwhile climate models used by the UK Government project a decrease in summer rainfall of up to 60% by 2080, but more on this later. The Met Office keep the data here. I dispute that the Met has advanced its probity to the point of deserving the adjective “slightly”. Everyone should know by now that the correct way to view the MO longer range forecast is it will be the opposite of what they say. Otherwise they would just usless at it wouldnt they , and would have been fired for incompetance years ago!! Matt Ridley has a post up saying that the wet June is just noise and linking to this post. The rainfall figure for England & Wales of 151.2mm, quoted above, appears to that from the 1910 regional data series, but the figure from the HadUKP data series, which goes back to 1766 seems to be 160.3mm, which actually makes it wetter than 1860, and obviously therefore, the wettest on record according to HadUKP. The HadUKP ranked data file confirms this. The Met still have not updated their HadUKP data yet for June (on your link). On their monthly summary just issued today, they are calling it a tie with 1860! Strange, it is updated when I look at it. The figures should be ranked from lowest at the top to the highest, June 2012 at the bottom. If it still doesn’t work, try repeatedly clicking the refresh button on your browser. I sometimes have this problem with HadCRUT data but not HadUKP. I just noticed your last comment. That is very odd but possibly the June summary is based on provisional data. June 2012 still shows at the top as “zero”! However the correct figure does show in the “Monthly Totals” as opposed to the “Ranked Monthly”, so I guess they will get round to updating it sooner or later! Even stranger! I just tried the refresh you suggested and it now appears correct. Didn’t they announce never-ending drought a few months ago? They really have a knack for weather. Paul, are you using Internet Explorer? There is something about the way it handles data files which means that sometimes it doesn’t get the latest one if it “thinks” you already have it. I don’t fully understand this but someone else may explain. I sometimes have to refresh several times before I get the latest file. It must be a more general problem then. The MO have confirmed that the June climate summary was produced before June 5th and was based on provisional data. They say the text will be updated to relect the final figure – after approx. 4-6 months! I caught the weather forecast this morning and I spat my coffee out when a meteorologist said “It’ll be dry and wet around most of the UK today”. She then went on to say that the Environment Agency has issued 100 flood warnings for the UK. BTW what does a “months worth of rain” mean? apparently that’s what the UK will experience later. Must be something like that warm-cold we keep getting.